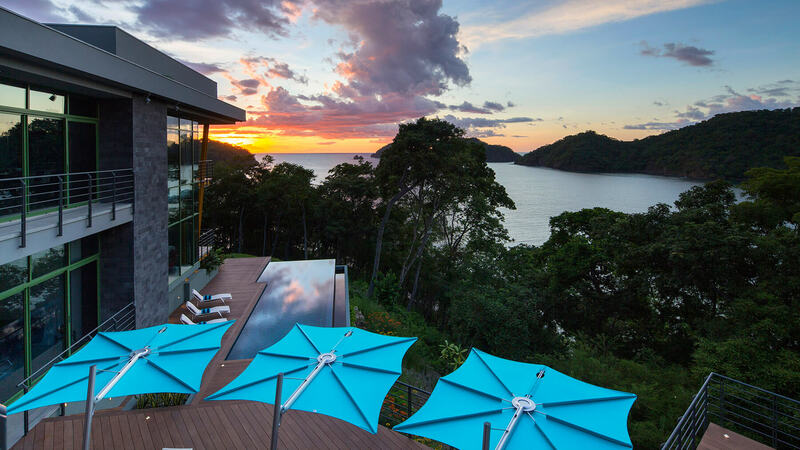 Casa Magayon, by Sarco Architects Costa Rica is located on a challenging hillside property in the Peninsula Papagayo Luxury Resort in Guanacaste, Costa Rica. 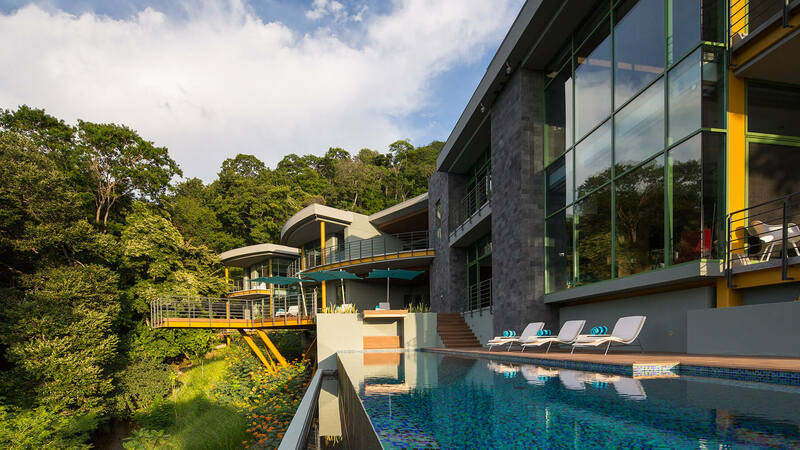 The land has a sharp 20-meter drop between the road front and a small linear ridge in an east-west direction that was selected as the location for the main social spaces and private master suite wing. 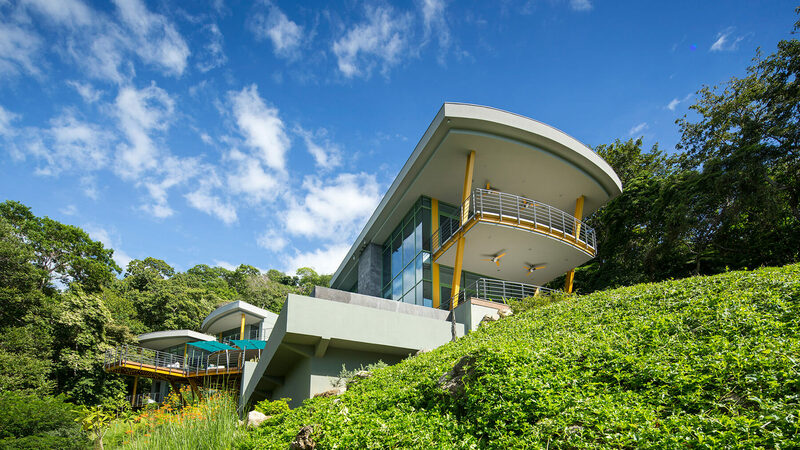 The rest of the house was laid out to follow the natural shape of the land as it turns into a hillside at about 45 degrees to the ridge. 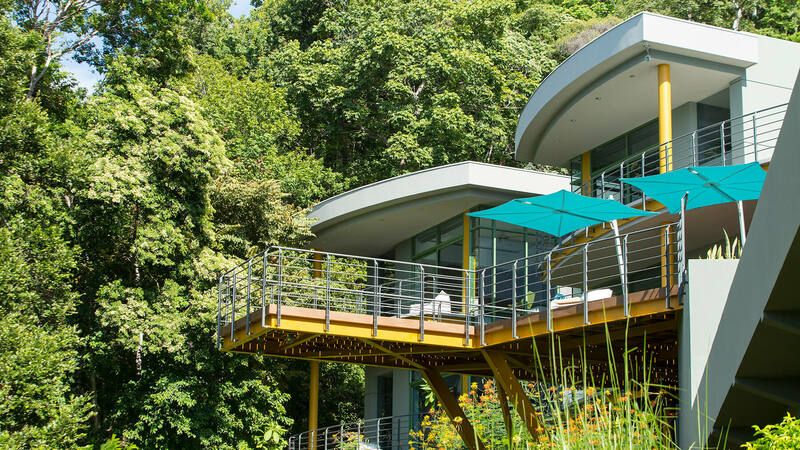 To the left of the ridge that now houses the main wing of the house is a sharp drop into a natural ravine. When it rains, the creek turns into a flowing creek and provides soothing sounds in the rainy season. 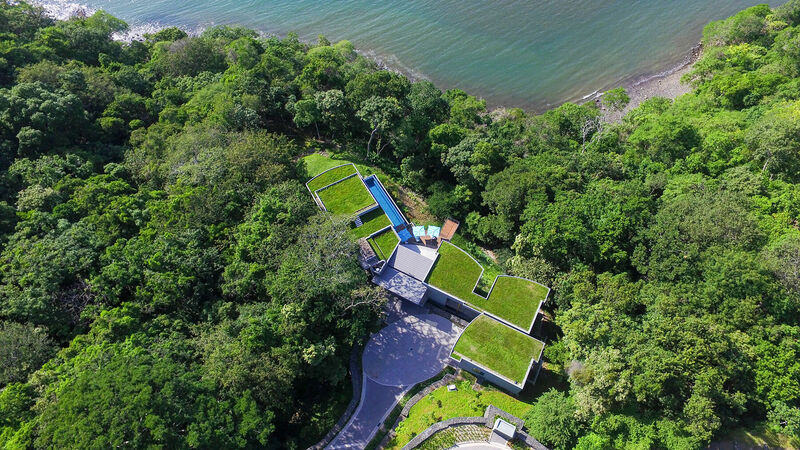 The property is very close to the water in a completely calm bay that overlooks the pacific and allows for a hike down from the home to a small rocky beach down below. 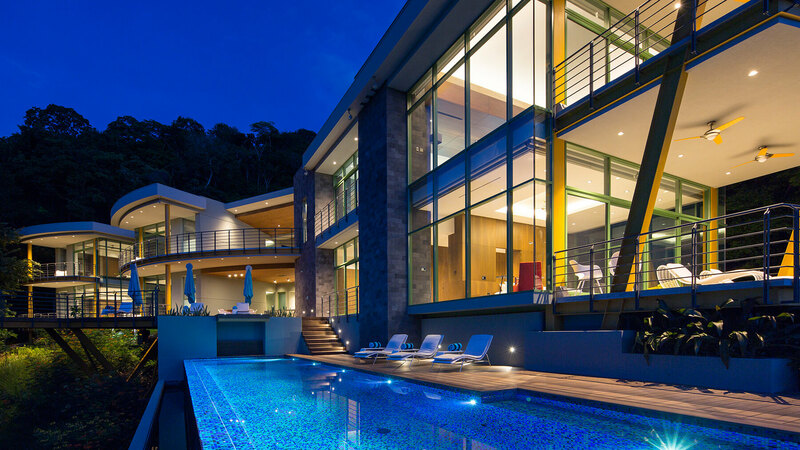 The home’s design concept is a series of independent glass cubes connected by outdoor covered corridors which all flow with the natural shape of the terrain. 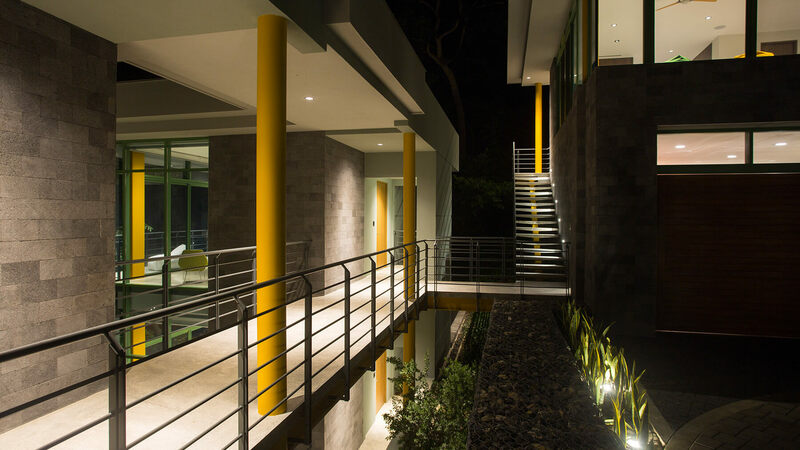 This provides a constant indoor-outdoor flow as you walk throughout the home. 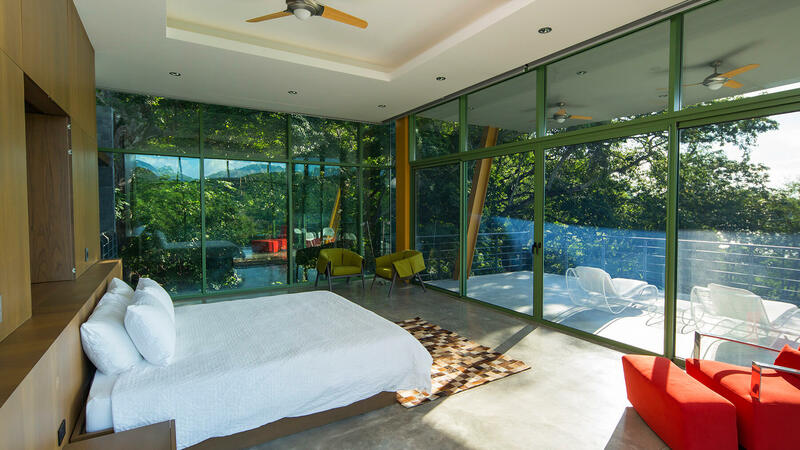 The design allows the enjoyment of the tropical jungle in indoor rooms and outdoor areas. 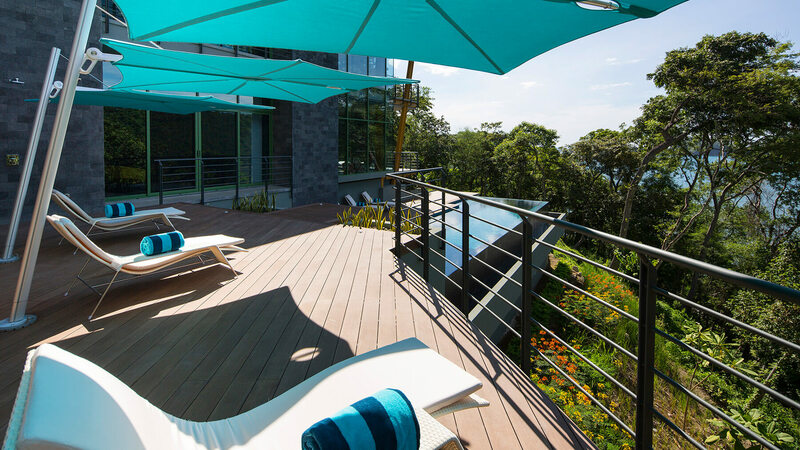 The outdoor spaces are designed nestled between the main wing and the bedrooms wing and become the centerpiece of the design. 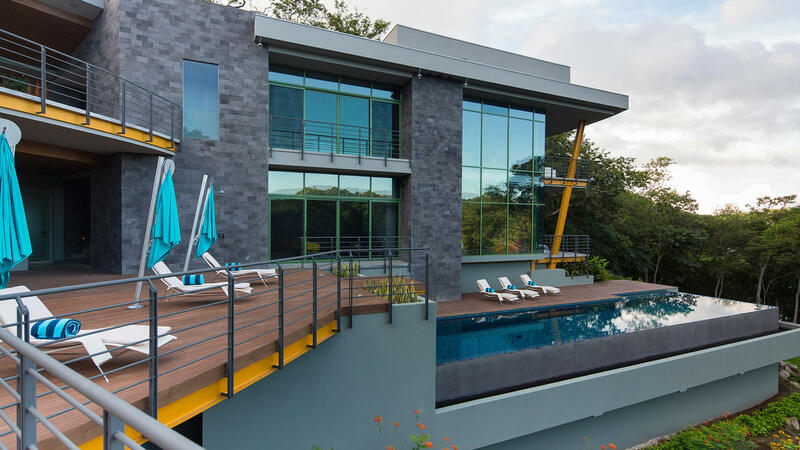 There is a deep lap pool parallel to the home’s main wing and an elevated deck space and a steel lookout bridge elevated 12 meters over the land below. 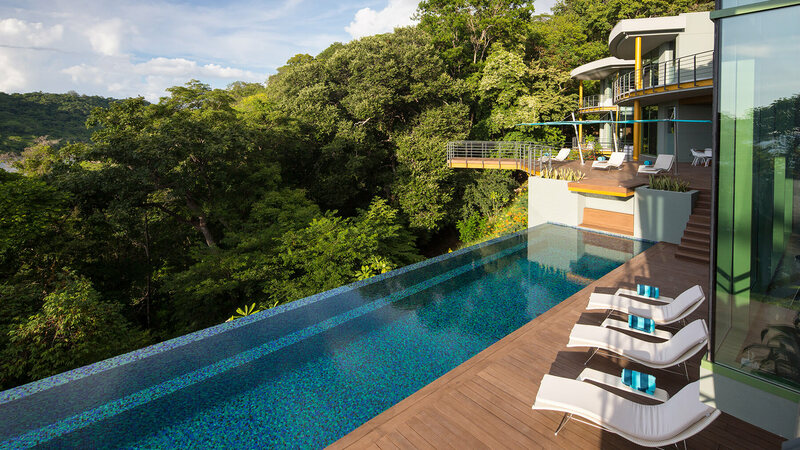 There is also a jumping platform to dive into the pool. 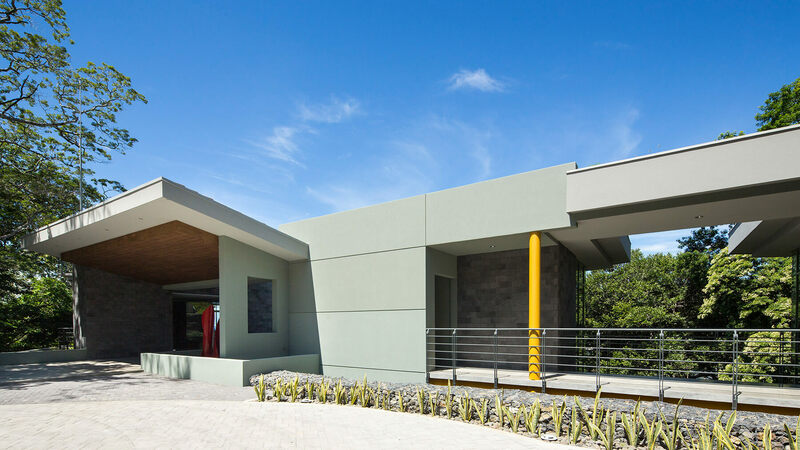 The exterior architecture of the home features natural grey lava stone walls combined with a two-tone palette of cool grey and olive-grey stucco walls. 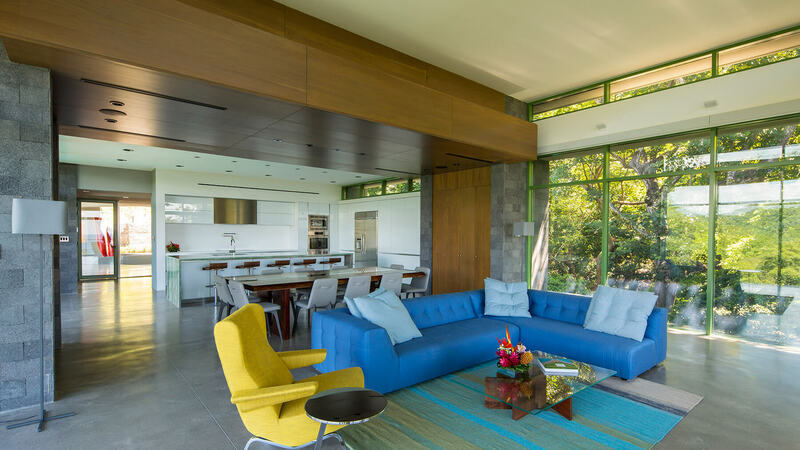 This contrasts with the large glass cubes with custom green framing which play with the burnt-ochre exposed steel structure. 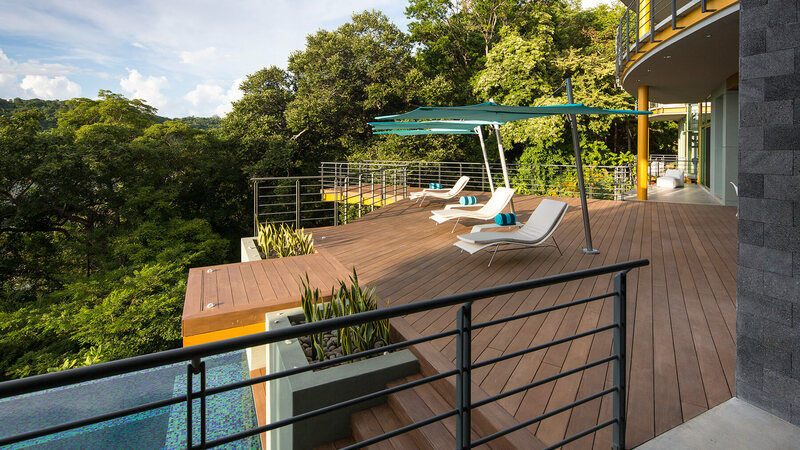 These elements create a material palette that is inspired by the natural colors in the surrounding jungle. 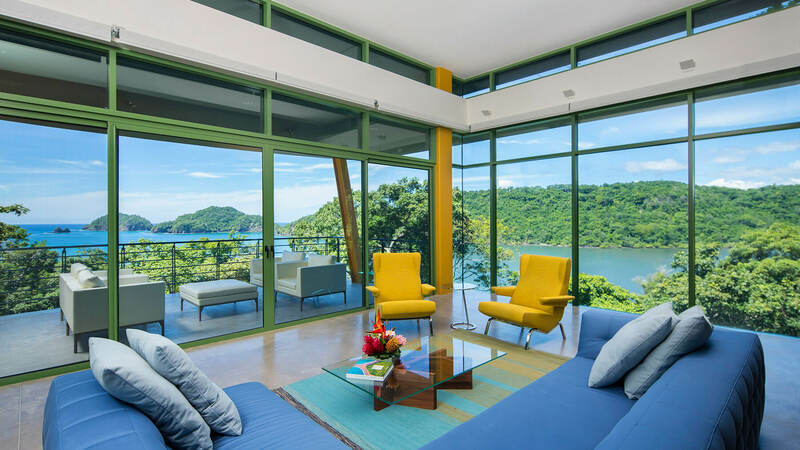 The glass cube concept provides the desired transparency which brings the jungle, the view to the bay and the main sunset view to the ocean completely inside the home. 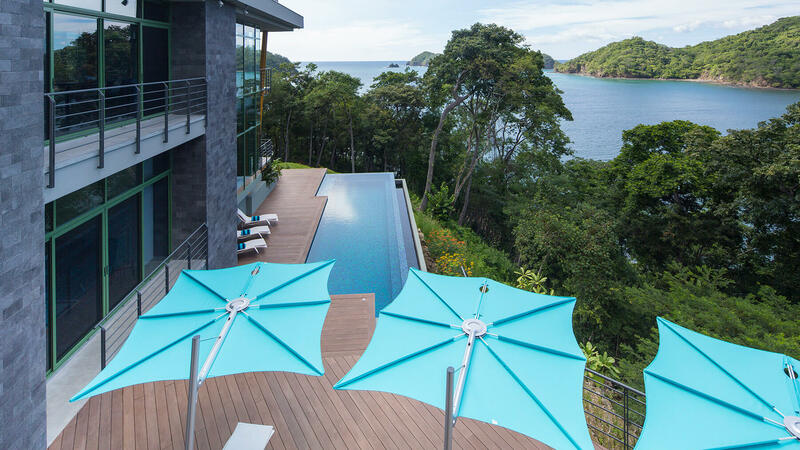 The indoor-outdoor theme is expressed throughout the home. 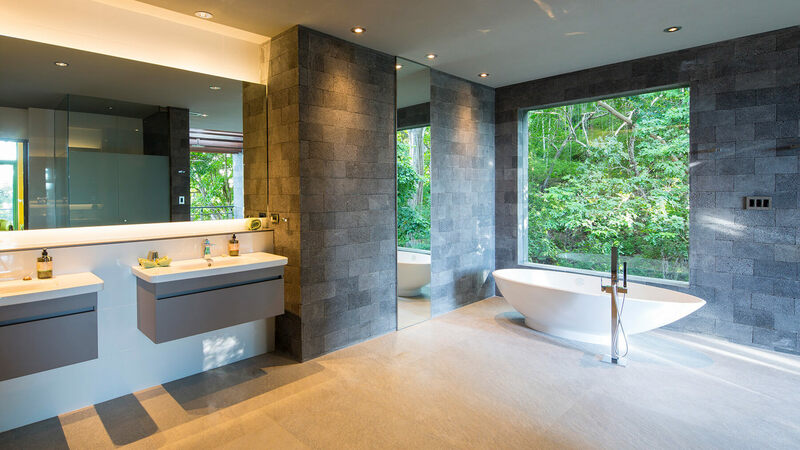 Exterior stone surfaces flow indoors such as in the living room and master bathroom. 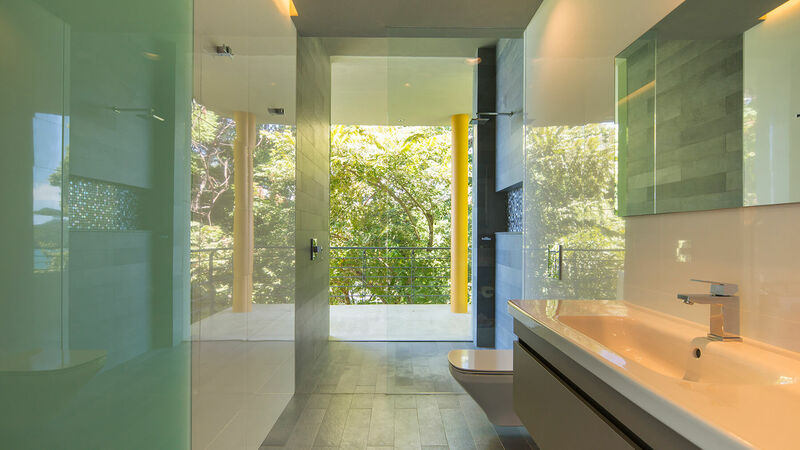 The bathrooms allow for an experience in connection with the jungle outside. 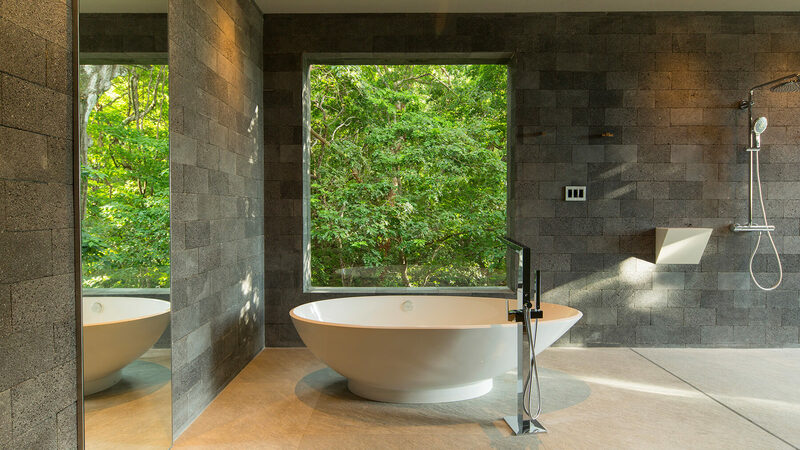 In the master bathroom the free-standing tub is framed by a square picture window facing the creek area. 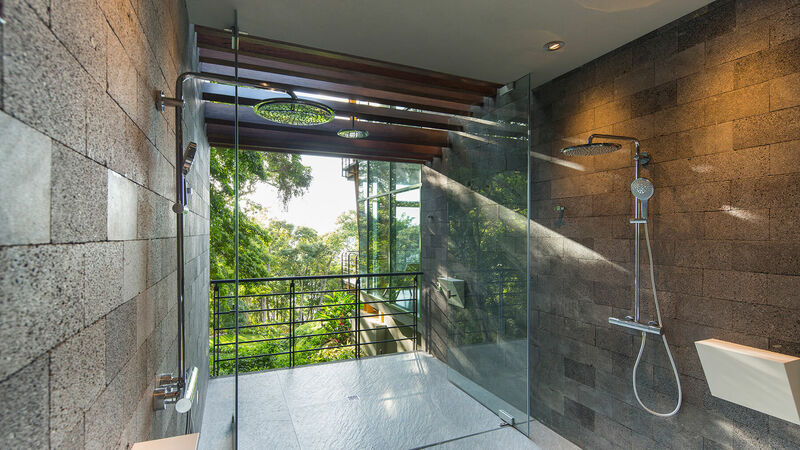 There is also a large open shower with frameless glass doors that open out to the outdoor shower area. 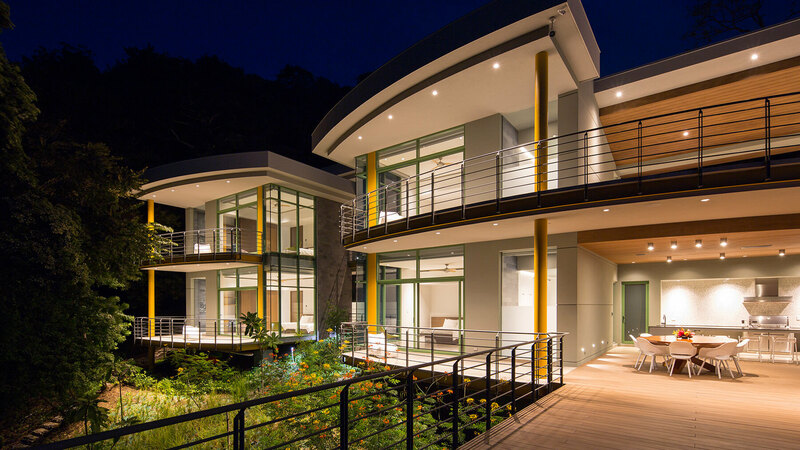 The architectural design and its modular approach helps to reduce the home’s air conditioned area. Only the living areas needed are be air conditioned, and no hallways or staircases are conditioned. 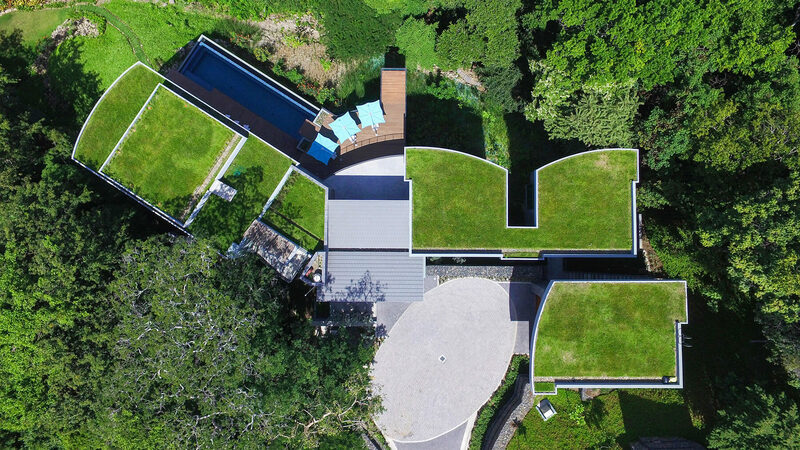 This allows the home to “grow” with the need of spaces depending on the number of guests at the house. 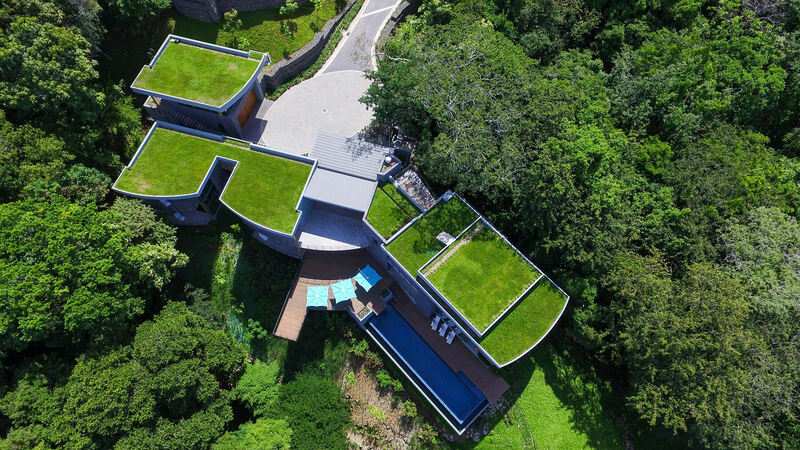 The natural green roof with extensive overhangs provide very good insulation and solar control. These strategies all help to massively reduce the total air conditioning load needed to cool the home. 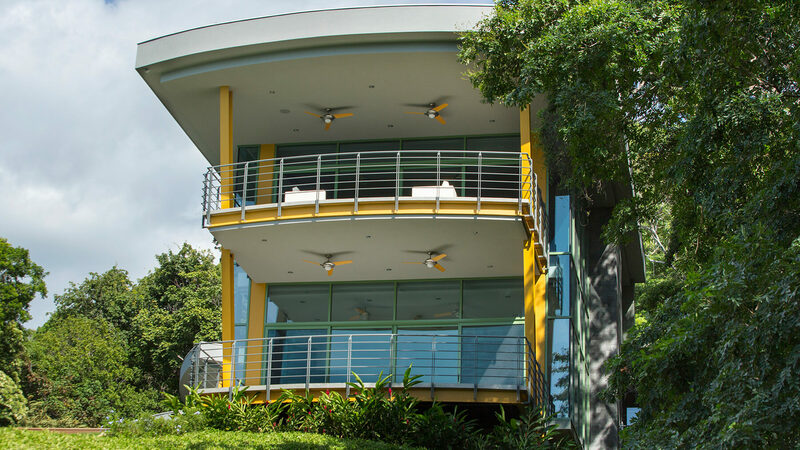 These sustainable architecture strategies and our energy analysis optimisation process bring rewards to the homeowner with a significantly reduced energy bill. 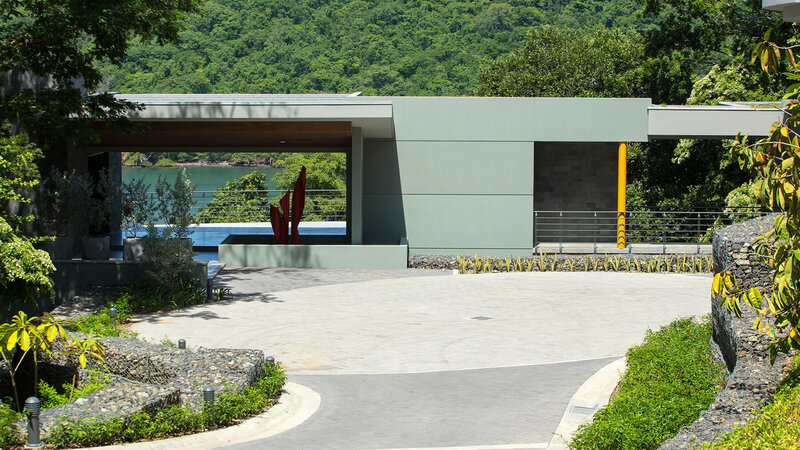 The main wing was placed along the ridgeline but slightly rotated so the mass of the two-story tall structure provides shade to the outdoor areas in the afternoon of the days in the dry season, when the sun angles southward. 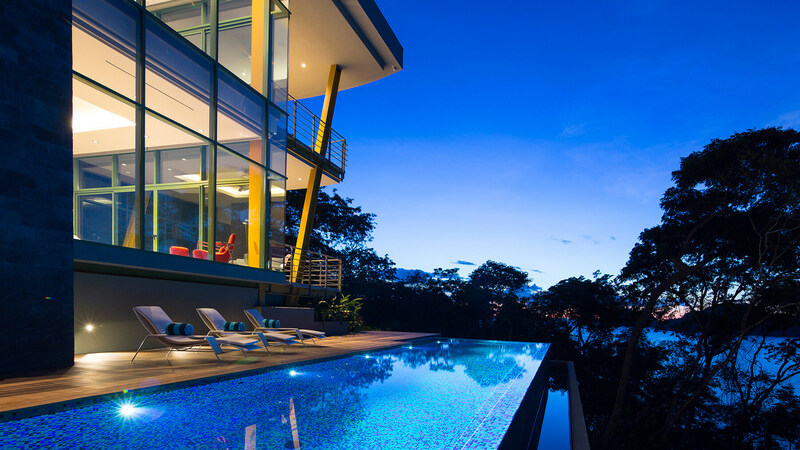 The interiors of the home, were fully designed by SARCO Architects Costa Rica. 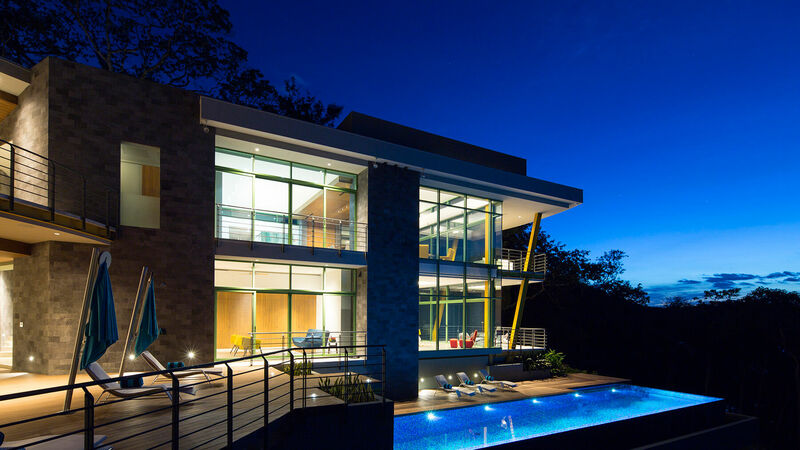 The home features a muted and simple palette of materials. 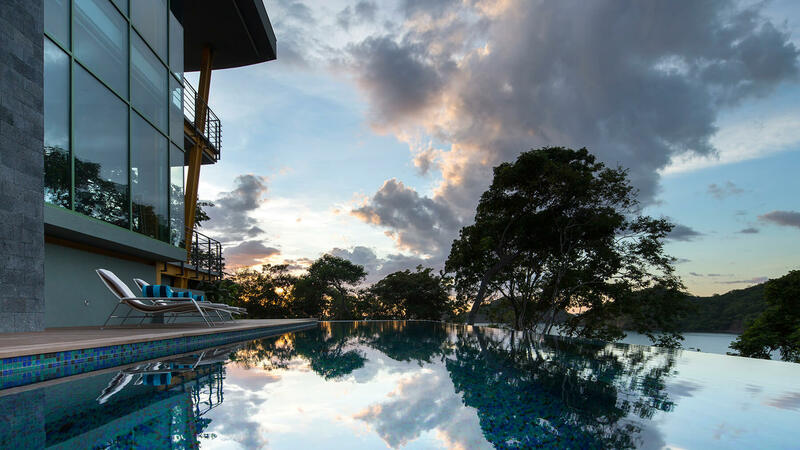 There is the grey polished concrete floors, custom-designed natural wood built-in furniture cabinets, and a few flat white smooth plaster walls. 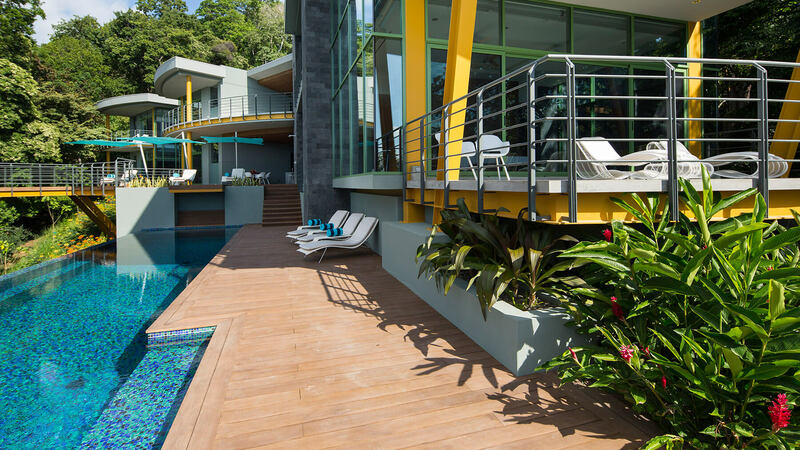 The home actually features little wall surfaces. 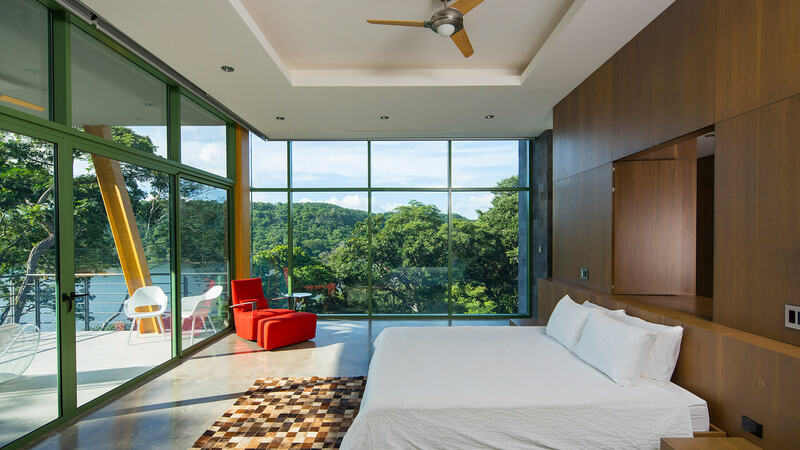 The large glass surfaces and warm wood paneling dominate most of the spaces. 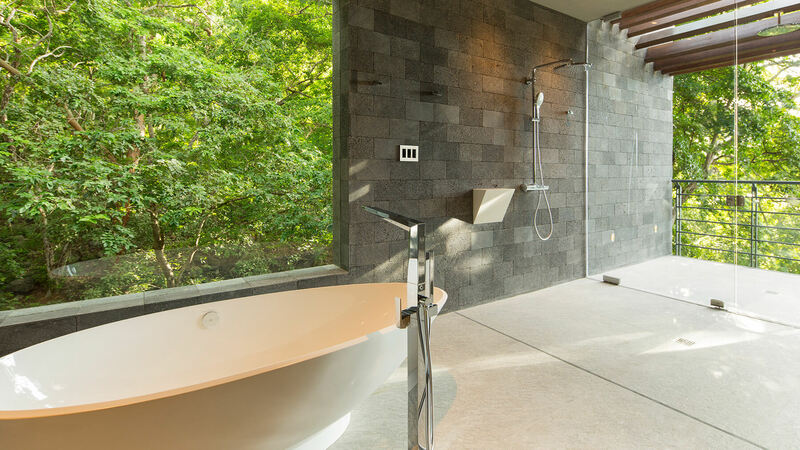 The floors throughout the home are all polished concrete, with porcelain tiles in the bathrooms. 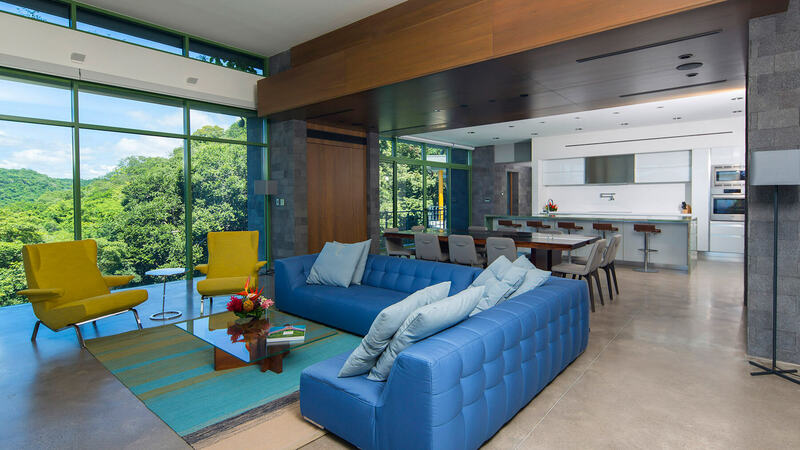 The main social wing of the home is designed as a large open plan, but the use of materials clearly defines the spaces within. 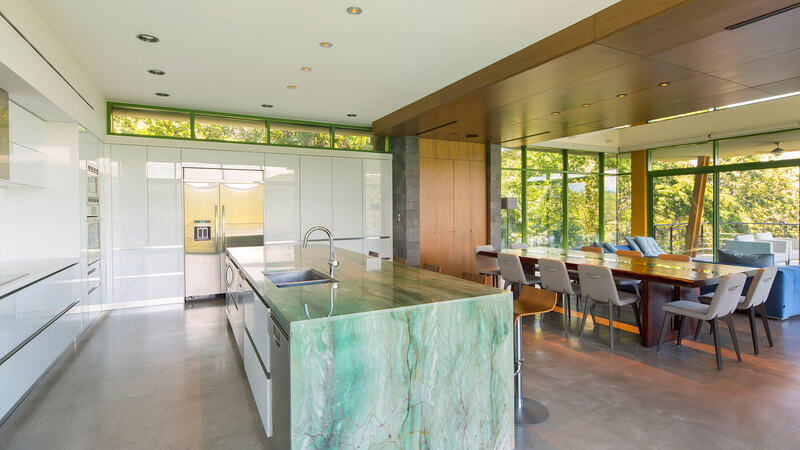 The dining area has built-in wood cabinets which flow onto a large wood panel ceiling. This creates an inverted “U-shaped” wood surface under which sits a large natural wood slab table. 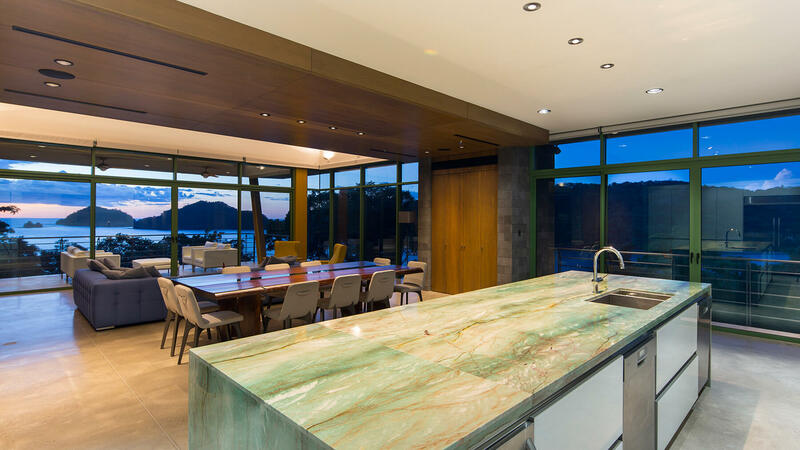 The open kitchen features glossy-white frameless glass fronts that reflect the ocean view off the cabinets. 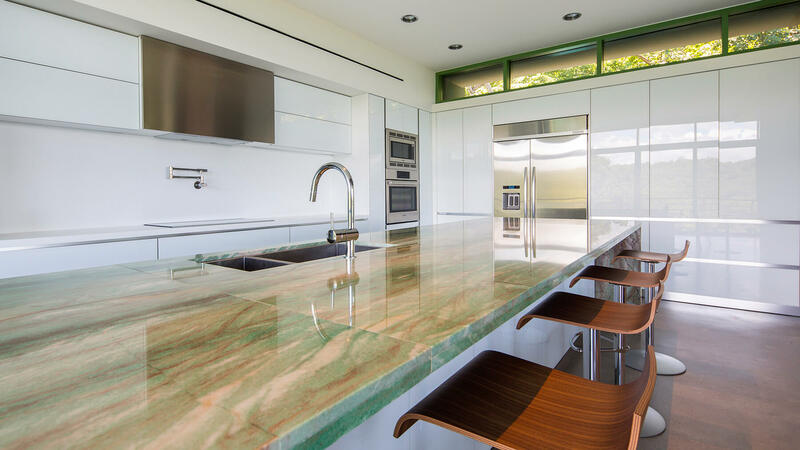 The large island is a centrepiece with an exotic-green granite stone counter. 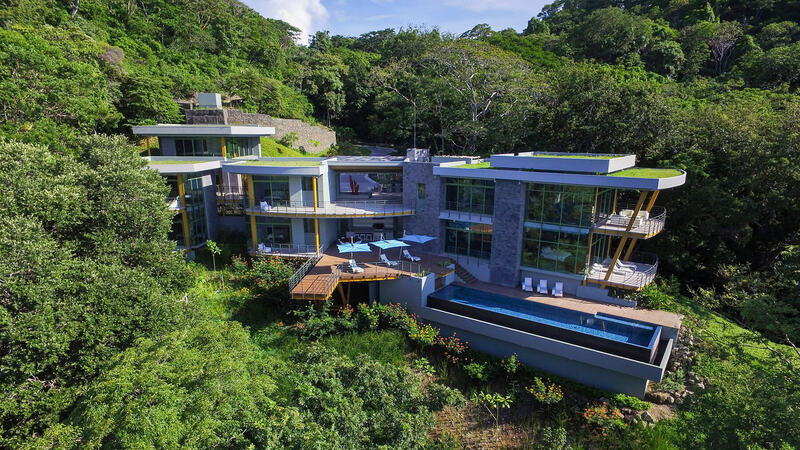 The entire team at Sarco Architects Costa Rica is extremely proud of our design for Casa Magayon. 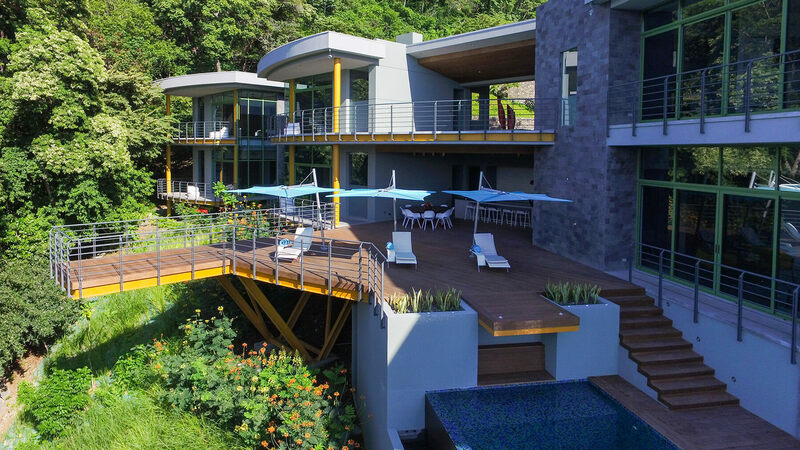 In this project, Sarco Architects Costa Rica performed a full design-build service for our client. 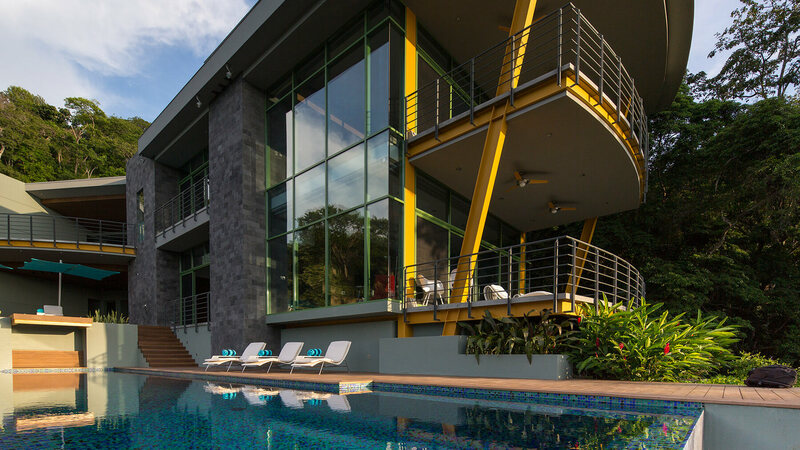 Project management and construction were part of the services we provided for this project. 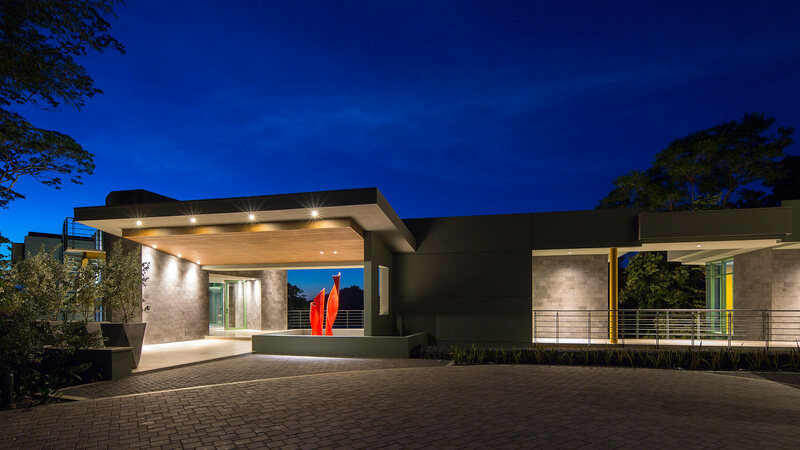 Our efforts even included the creation of the steel art piece at the entrance of the home. 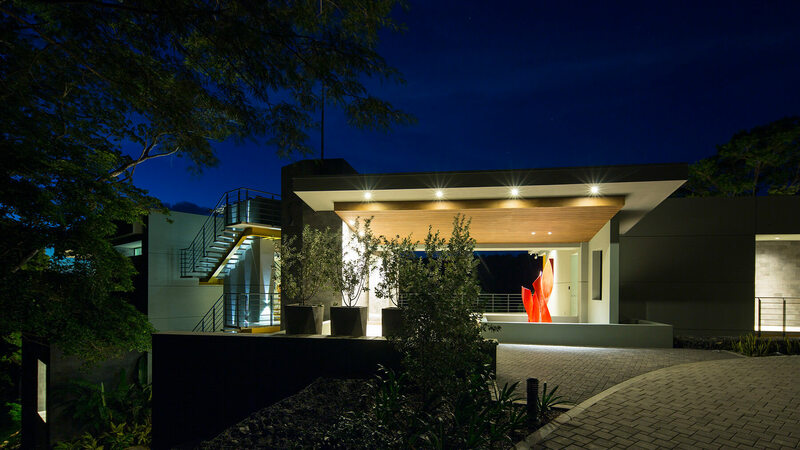 We converted some scrap metal from another project into the feature element at the entrance of the home. 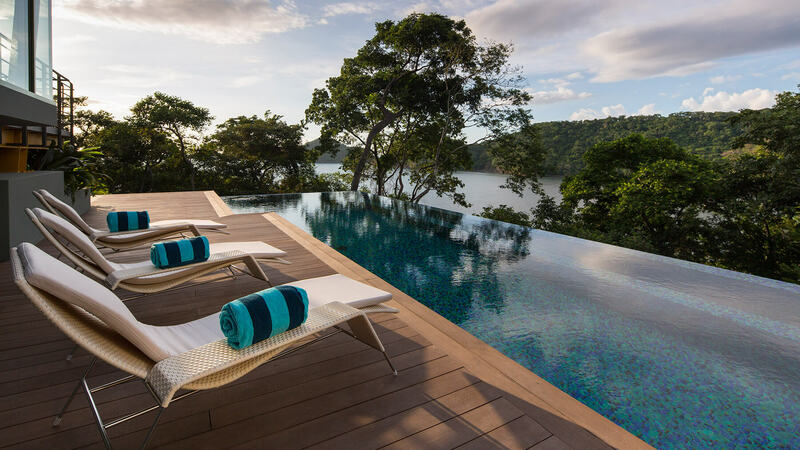 Sarco Architects Costa Rica is proud to bring to you our latest completed project in Peninsula Papagayo, Costa Rica: Casa Magayon.